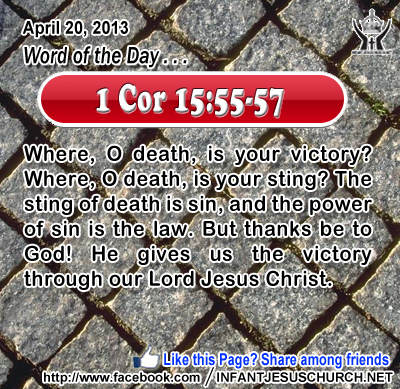 1 Corinthians 15:55-57: Where, O death, is your victory? Where, O death, is your sting? The sting of death is sin, and the power of sin is the law. But thanks be to God! He gives us the victory through our Lord Jesus Christ. Heavenly Father, thank you for giving us victory in Jesus. In our daily struggles with sin, please make his will triumphantly present in us now, just as it will be when he raises us from death and brings us home to you. Through Infant Jesus we ask it. Amen. 60Many of his disciples, when they heard it, said, "This is a hard saying; who can listen to it?" 61 But Jesus, knowing in himself that his disciples murmured at it, said to them, "Do you take offense at this? 62 Then what if you were to see the Son of man ascending where he was before? 63 It is the spirit that gives life, the flesh is of no avail; the words that I have spoken to you are spirit and life. 64 But there are some of you that do not believe." For Jesus knew from the first who those were that did not believe, and who it was that would betray him. 65 And he said, "This is why I told you that no one can come to me unless it is granted him by the Father." 66 After this many of his disciples drew back and no longer went about with him. 67 Jesus said to the twelve, "Do you also wish to go away?" 68 Simon Peter answered him, "Lord, to whom shall we go? You have the words of eternal life; 69 and we have believed, and have come to know, that you are the Holy One of God. Paul the Apostle tells us that it is the work of the Holy Spirit who make clear to the eyes of our heart and mind to understand the truth and wisdom which comes from God. Faith is the key to considerate and experiencing God's action and work in our personal lives. Paul the Apostle tells us that "God's love has been poured into our hearts through the Holy Spirit which has been given to us. We can know God individually, and we grow in recognizing his voice as we listen to his word and obey his teaching. Do we believe, as Peter did, that Jesus has the words of eternal life and the power to change and transform your life? Ask the Lord Jesus to increase our faith that we may grow in knowing, loving, and serving him as our Lord and Redeemer, Teacher and Healer, Master and Savior. Loving Infant Jesus, you have the words of everlasting life. Help us to cast aside all doubt and fear so that we may freely embrace your word with complete trust and joy. We surrender all to you. Be the Lord of our life and the Ruler of our heart. May there be nothing which hinders us from trusting in your love and following your will.